Anywhere in California it is easy to see the effects of the latest drought. Surface water levels, such as lakes and rivers, are visibly low and changes in landscape vegetation are obvious. Windshield wipers on California cars have been put to little or no use. But what about the impacts on water resources we can not see with our eyes? NASA’s Gravity Recovery and Climate Experiment (GRACE) has produced satellite images showing substantial groundwater depletion since 2002 when GRACE first went into orbit around the Earth. Diagram of a cross-sectional view of an Aquifer with corresponding layers above. Groundwater is stored beneath the surface in porous sediment layers called aquifers. Wells tap into this water resource to extract water for residential, public, or agricultural use. 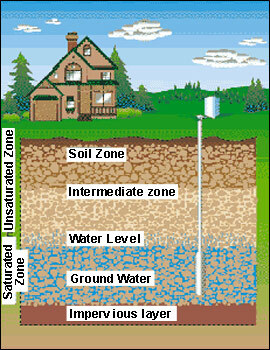 Groundwater generally is used as a backup reservoir during times of low surface water levels. Rain replenishes or recharges, this important water resource. Without rain recharging the aquifer, rates of pumping out from wells exceeds the rate at which the aquifer is replenished. This process causes groundwater levels to fall quickly, as can be seen in the GRACE images above. GRACE satellite images track changes in gravitational pull on the surface of the planet. Changes in mass due to changes in aquifer water storage correlate with discrepancies in gravitational attraction. These differences in the level of attraction are mapped to produce images like those above. The progressively redder color, most notably in the Central Valley, indicates the more groundwater loss. GRACE is a cooperative mission between NASA and scientists at the University of California, Irvine. To learn more about physical properties of groundwater, visit the Clean Water Stores’ website Resources section. You can also follow us on Facebook and Pinterest for further updates on the West’s ongoing drought. 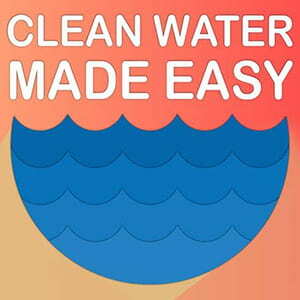 In the meantime, look into strategies you can employ to start saving some of the water you use every day!